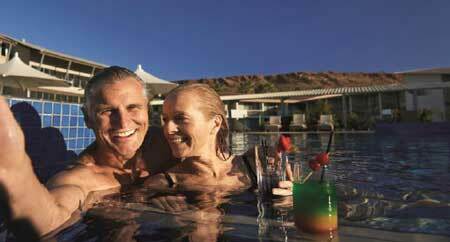 Tourism NT promotional images: A middle aged couple very fond of selfies – drinking cocktails by the poolside (Monte Carlo? Johannesburg? Anywhere? ); in a wide open space (Kazakhstan? Serengeti? ); and on a camel (what’s that mound in the background? Uluru / Ayers Rock?). On present indications the financial debt Adam Giles is inflicting upon Territorians will outlast his Chief Ministership by many years. What’s even more distressing is that this debt is a gamble, rather than a well considered investment. And it benefits few, mostly builders. That would be a good thing if there were a demonstrated need for all this bricks and mortar. At the same time the industry that is labour intensive, enormously prospective and using a wholly renewable resource – tourism – is in the hands of a bloated ($53m in 2014-15), chronically underachieving government instrumentality bereft of vision. Mr Giles is showing no concern about that, and the Tourism Minister, Matt Conlan, remains in his job. Meanwhile, the NT taxpayer will be spending $20m over the next 20 years for rent of a second courthouse which we don’t need because crime is going down, remember? We’ll be guaranteeing, for the next 10 years, the rent on 45 apartments. A similar deal is under discussion with the promoters of a new development on the site of the old Melanka. We’ll be paying rent in the Alice Plaza for Tourism NT employees who could easily have been accommodated in the Greatorex Building, which we own, opposite the police station. Instead we’re using that space for a second police station which we don’t need because crime is going down, remember? We’re spending $15m on two police stations, at Yuendumu and Utopia, with no vision and plans in place, as far as we know, for positive economic and social development in either place. Alice residential real estate values are in decline – if not in freefall. So why does Mr Giles encourage and fund the provision of more dwellings? This is where the gamble comes in. Maybe we’ll get a salt mine south of town. Mr Giles pretends it’s a certainty. The company in question doesn’t say that at all. Maybe we’ll have a natural gas industry. Mr Giles thinks so and is making promises to the NSW Government. Does anyone recall Mr Giles, as the candidate for Braitling, standing on a platform of flogging gas obtained by fracking, without majority consent, to another state for an undisclosed period, at an undisclosed price? What we do remember is another CLP government, long before Mr Giles arrived in the NT, that flogged crude from the Mereenie oil field, just to the west of Alice Springs, to South Australia from where we then imported it as diesel for an extortionate price. That oil, worth around 26c at the wellhead at the time, was so pure that it could be run in conventional engines, with removal of sand in a centrifuge the only refining required. The CLP turned a blind eye to this, government after government. Labor did no better. Talking about diesel: How come today it sells for around $1.50 in outback Queensland while in Central Australia it costs 30c to 50c more? Mr Giles was going to put a stop to high NT fuel prices, remember? On October 14 we put 12 questions to Mr Giles about the $1.2b gas pipeline project, and to his Ministerial colleagues Chandler, Willem Westra van Holthe and Styles. Amongst them were: How would the community of Central Australia benefit from that venture? What is the money value of these benefits? We still have no answers. Reality check: Except for fly-in, fly-out mine workers (if the mining and gas projects come to pass) there is not the slightest need for any new residential accommodation. So no mine workers, no Melanka, no railway station development. That means any blow-in Greenie or Labor sympathiser who agitates against fracking and flogging our resources interstate, endangers the revitalisation of good old Alice through high-rise complexes. Is that the game Mr Giles is playing? A blow-in himself, he wants to ram though projects he doesn’t even bother informing himself about. Mr Giles was pushing the pipeline before the fracking report had even been delivered, let alone read by him. Meanwhile what The Centre could be brilliant at is condemned to neglect. 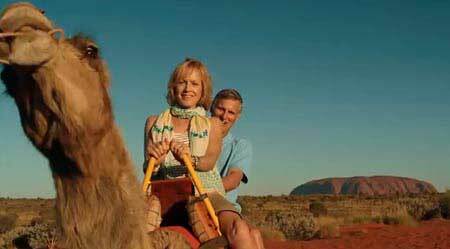 We asked the government’s Tourism NT under what theme, what motto, Central Australia is currently being promoted, how are would-be visitors told about the magic and adventure of Central Australia. Tourism NT gave us a link to 12 “Do the NT” 30 second TV commercials. Six were about the Top End and two about Uluru. The only one entitled Red Centre included footage of Tennant Creek and – again – Uluru. So Alice Springs and environs got about one 24th of the promotional material and that included one golfing and two pub scenes – something people can do anywhere in the world. Mr Conlan turning his home town into a mere dot on the map is no coincidence: it’s clearly a strategy, met with a crescendo of silence from “watchdog” Tourism Central Australia. Mountain biking (the subject of a media release by him today) alone won’t get us to where we need to be. The commercials can be seen here. Alice Springs housing prices are way too high. Free fall is probably a good place for housing prices to be. People might be able to afford to move here and invest in a future for themselves in this town. It would be a bummer for those of us with already difficult mortgages but perhaps good for growth in town, definitely good for those young couples hoping to have kids AND buy a house. I think this is actually the reason the supposed Member for Braitling wants to push for these eight story buildings. He is trying to prop up the CBD land values for his mates in the real estate game. Shops are empty and landlords are finding it difficult to get tenants at high rents. They don’t want to lower the rents because that leads to an immediate decrease in the value of their assets. An option for expansion upward will artificially maintain or increase the land value. Good for the businessman perhaps not so good for the poor bugger trying to live in this expensive place. Personally I prefer not to live in a high rise overcrowded city, part of the reason for moving to Alice. Can’t really see the need for either of these eight story ugly proposals but if we must have them perhaps we could concentrate them in one ugly area. Instead of spreading them all over town. Isn’t that what a central business district is for? Real estate in free fall? It most certainly is not. The fact is the Government can’t afford to promote tourism in Alice Springs and the Centre. In order for visitors and locals to enjoy the benefits of recreation in the Great outback fully, the Government would have to supply each one at enormous cost with the following kit: A telescope (for viewing unapproachable ranges), a camera Telescopic lens for icons, a long range fuel tank (for unnecessary driving to negotiate restricted areas), pet minding booths, a pair of bolt cutters and/or barb wire cutters (and fence mender of course, a few new locks), a dossier of variety of permits, exemption from trespass, or just a helicopter. Yep, great leader good ole Giles, huh. Such is life I guess, we have to just all sit around till the next election to make him and co (Conlan included) listen! Can’t have a gas pipeline (too expensive). Can’t have a tall building on the Melanka site (no one to live in it). Can’t have a train station / hotel on Whittaker St (no one is coming). Don’t need a court house (crime is falling). Don’t need a cop shop (crime is falling). Tourists are being dudded (that is, the few who manage to get here). Most mines are quite likely myths (there go the new roads). Crime is falling (or so we’re told). Real estate is in free-fall (this is true). So, can anyone think of any reason at all not to love this town? That is not a rhetorical question. Does any town anywhere else in Australia have so much going for it all at the same time?